Badan Penyelenggara Jaminan Sosial Kesehatan - BPJS Kesehatan is the national health social security agency of Indonesia. BPJS Kesehatan is an Indonesian state-agency which was established by the Government of Indonesia to implement the health social security program. BPJS Kesehatan is completely owned by the Government of Indonesia and operates primarily as a Social Security Provider for Health. BPJS Kesehatan was formed on 31 December 2011 to replace the function of PT Asuransi Kesehatan Indonesia (Persero) or ASKES - state-owned health-care insurance company in Indonesia - under the laws of the Republic of Indonesia No 24 of 2011. 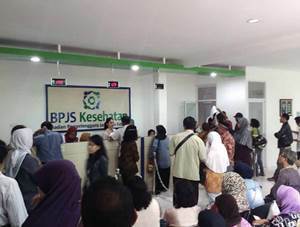 Headquartered in Jakarta, BPJS Kesehatan has 24 branch offices, 384 operational offices in regency (KLOK), 34 liason offices, and 1,487 BPJS Kesehatan centers spread in 13 regional offices across Indonesia (as of December 2015). Its head office is registered at Jl Letjend Suprapto Kav 20 No 14 Cempaka Putih, Jakarta Pusat 10510. Maximum age of 58 years old prior to the date of 31 August 2017. Education background in S2/S3 Hospital Management, Health, Health Insurance or S1 General Medicine / Dentist / S1 Public Health. Required experience for minimum 10 years in Hospital or Practitioners in the management of the National Health Insurance. Preferably have a strong understanding about the concept of social health insurance. Required experience for minimum 10 years in the field auditing at government agencies or large companies. Preferably have a strong understanding about the concept of social health insurance and insurance financial management. Education background in S2/S3 Law. Required experience for minimum 10 years in creating Legal Products or as draft (Act, Regulation etc). Education background in S2/S3 Hospital Management, Health, Health Insurance or S1 General Medicine / Dentist / S1 Public Health or S2/S3 Accounting, Economics, Finance or S2/S3 Law. Preferably have minimum 10 years of experience in managerial level. JobsCDC.com now available on android device. Download now on Google Play here. Please be aware of recruitment fraud. The entire stage of this selection process is free of charge. BPJS Kesehatan - Member of the Committee and Secretary of the Supervisory Board BPJS August 2017 will never ask for fees or upfront payments for any purposes during the recruitment process such as transportation and accommodation.